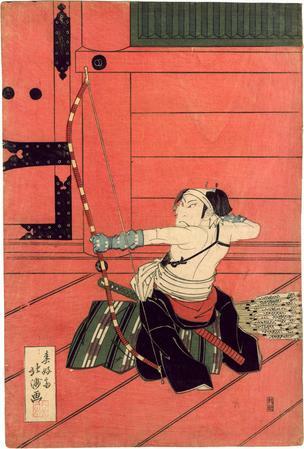 "To encourage martial skills in the peaceful period that followed the establishment of the Tokugawa shogunate in the early seventeenth century, archery contests were held in the 390-foot hall of the Sanjūsangendō in Kyoto, the winner being the archer who shot the most arrows the full length of the hall in a twenty-four hour period. In 1667 Hoshino Kanzaemon shot 8,009 arrows the full length in 10,542 attempts. Twenty years later, that achievement was bettered by Wasa Daihachiro, who succeeded with 8,133 arrows out of 10,053. That record was never surpassed. A dramatization of Wasa's feat was written by Namiki Gohei, and revised by Nakamura Utaemon III for the present performance. Wada Raihachi (Wasa) is involved in a plot against Koshino Kozaemon (Hoshino) to take over the house into which he has been adopted. The plot involves murders, love affairs, and a lost treasure arrow, and is finally resolved when Koshino exposes Wada's villainy. The present print portrays Wada during the archery contest at Sanjūsangendō at which, in Gohei's play, only a judge is present. This is possibly the right panel of a diptych. The impression in the Kyota Kyakushoku Jō is cut out, as usual, and a hand-painted wall added, extending far to the left as a background. No other figures are shown. The addition of another panel of architecture at the left, printed in the luxurious, fugitive pink used here, would have been both striking and expensive." Quoted from: The Theatrical World of Osaka Prints by Roger Keyes, Philadelphia Museum of Art, p. 94. There is a full-page color reproduction on page 95. This play, Appare keisei matsura no tōriya, was written by the celebrity actor Nakamura Utaemon III (1778-1838) who revised an earlier drama by an important Osaka playwright. The story involves an attempt to overthrow a master archer, more than one murder, romantic entanglements, an archery contest, and a lost heirloom arrow. In this staging in the first month of 1824, the actor Ichikawa Ebijūrō I (1777-1827) has the role of Wada Raihachi, based on the historical figure Wasa Daihachirō who in 1687 shot a record-breaking 8,133 arrows in one 24-hour period, the entire length of the Sanjūsangendō hall (390 feet). In the kabuki play, Wasa is exposed as a villain involved in a violent inheritance plot, although the real archer had no such stigma. This color woodcut with its luxurious, bright pink background is very likely one panel from a larger set. This particular sheet was probably the most appealing (“action-packed”) and would have been bought in the largest numbers and thus be preserved more often than the other panels. Until the end of the nineteenth century, polyptychs with two or more panel sheets of paper that together formed an entire panorama were designed in such a way that consumers could purchase one sheet of a set and still have a picture that could be enjoyed on its own. Naturally, publishers hoped that most kabuki fans and print aficionados would prefer to collect all the sheets possible for a complete scene. from Ukiyo-e Prints in the Mike Lyon Collection by Cori Sherman North. Illustrated in black and white in Ukiyo-e Masterpieces in European Collections: Musées Royaux d'Art et d'Histoire, Brussels, vol. 9, Kodansha, 1989, p. 206, #133.